Astronomers have discovered a new type of star collision. Experts restored the history of the outbreak that struck humanity in the seventeenth century. 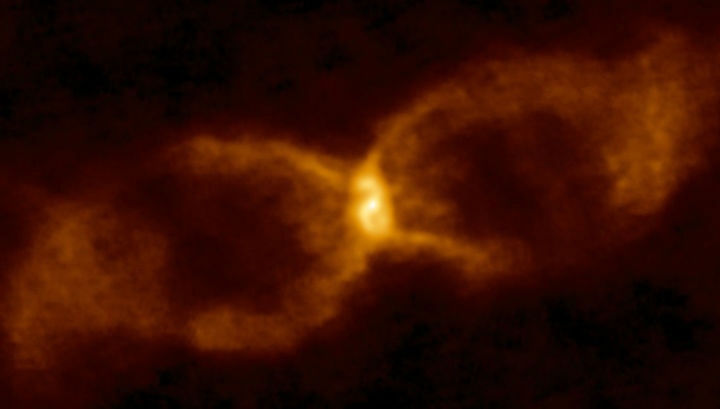 It turned out that it was never before observed phenomenon: the clash of brown and white dwarf. Such conclusions are set forth in a scientific article published in the Monthly Notices of the Royal Astronomical Society magazine by a group led by Mark Wagner from Ohio University in the USA. The object, known as the SK Chanterelles, has long attracted the attention of astronomers. Now it is a collection of gas and dust in the form of an hourglass and a dim compact core in the center. In 1670, a powerful flash was observed in this place, visible even to the naked eye. It looked like a new star appearing in the sky. Such events are traditionally called astronomers by new stars or simply new ones, although they are not related to the real birth of stars. By the way, the event of 1670 is the oldest, reliably documented new one, and at one time it became an astronomical sensation. Experts have long established that this outbreak was the result of a collision of two objects. But which ones? The most popular point of view is that these were the so-called main sequence stars, that is, those in which energy is produced by converting hydrogen to helium. However, this is not the only option. Not so long ago, in the SK Chanterelles, radioactive molecules were discovered, in connection with which the specialists reviewed the nature of the “road accident participants”. According to their calculations, at least one of them was a red giant. And now the Wagner team has provided strong evidence for an even more intriguing version. The authors used the ALMA radio telescope. With it, they found chemical traces of an ancient collision in a nebula left after the explosion. Astronomers have noticed the presence of lithium chanterelles in the UK. In stars, this element is rapidly consumed as a result of thermonuclear reactions. From this they concluded that the source of lithium could be a brown dwarf. This is the name of the body, which lacked mass in order to start thermonuclear fire in its depths. Thus, it is an unborn star, a cross between a full body and a very large planet like Jupiter. After going over suitable candidates for the second participant of the collision, the authors settled on white dwarfs. “Vesti. Science” (nauka.vesti.ru) told in detail about these bodies. In brief, we recall that these are the cooling cores of small burnt stars, a kind of dead luminaries. “The presence of lithium together with unusual isotope ratios of carbon, nitrogen and oxygen elements indicates that a brown dwarf substance fell on the surface of a white dwarf. Thermonuclear“ burning ”and eruption of this material led to the appearance of the hourglass that we see today.” – explains the first author of the article Stewart Eyres (Stewart Eyres) from the University of South Wales. The same version is supported by the organic matter found during the same study: formaldehyde (H2CO) and formamide (NH2CHO). The authors believe that these molecules could not be formed after the collision, since the environment of the SK Chanterelle is not suitable for this. But the more they could not survive in the flaming hell of ordinary stars. The “homeland” of these substances could be the same brown dwarf. Probably, in a collision, not all of its matter fell into the hell of a thermonuclear flash. A significant part was scattered by the blast wave and retained a relatively unchanged composition. So preserved mentioned organics. If the results of Wagner and colleagues are confirmed, this will be the first reliably established case of a collision between a white and a brown dwarf: a star leading a “afterlife” and a star that could not be born. The data on such an event seriously expands our understanding of the diverse interaction of stars and star-shaped objects. Previous story Russian chemists have proposed a new path for the synthesis of complex organic chemistry on Titan and the oldest Earth.